Looking for a beautiful and easy gift? These easy-to-make nougats are sure to fit the bill. Microwave marshmallows and chocolate in medium microwaveable bowl on HIGH 1-1/2 min. or until melted, stirring every 30 sec. Stir in nuts and cranberries. Pour into prepared pan; smooth top. Refrigerate 30 min. or until firm. Use foil handles to remove nougat from pan; peel off foil. Cut nougat into 2-inch squares. To package as a gift, cut parchment or waxed paper into 2-inch squares; place between nougat squares in festive container. Prepare using your favourite nut and fruit combination, such as almonds and raisins. 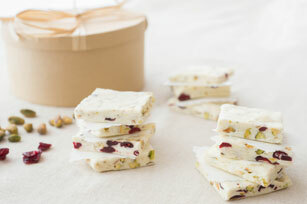 This easy-to-make nougat can be prepared ahead of time. Store in airtight container in freezer up to 2 months before serving.